Large Fallen Leaf Lake Luxury Home, perfect for the whole family! 3 bedroom plus loft rustic-luxury home at Fallen Leaf Lake! This is a great 3 bedroom plus loft opportunity at Fallen Leaf Lake and it is priced just right. Call us today! We book week long vacations Saturday to Saturday during the high summer season and 3 night minimums when school is back in. If you prefer a large updated house yet love the rustic surroundings of Fallen Leaf Lake, you will love this house. There are 3 large bedrooms and a loft area upstairs so plenty of room for the whole family. The loft would make a great kids sleeping area or second living room. The kitchen and bathrooms are bright and updated so you will have all the upgrades of a city home. The kitchen is fully stocked, has a gas range and is open to the dining room and large living area. The living room has vaulted ceilings and is very spacious. The big floor to ceiling windows overlook the trees with filtered views of the lake. The custom wood stair case and rock fireplace of this home are what give it the rustic mountain feel. The deck off the living room is a perfect place to host your nightly family gatherings. There is a small gas grill available also. Two of the 3 bedrooms have their own private decks for enjoying the forest scenery too! The general store and lake are less than a 3 minute walk away so everything Fallen Leaf Lake has to offer is very close. Kayaks can be rented down at the marina to keep your kids busy all day. Fallen Leaf Lake is a great area with lots of outdoor activities and this vacation rental is just steps from the lake, the general store and many miles of hiking trails. What makes Fallen Leaf Lake so wonderful is that it is small enough to walk everywhere making it ideal for a family with kids or couples looking to get away. Fallen Leaf is also only 25 minutes to the state line fun so if you are looking for a night out, you are right there. 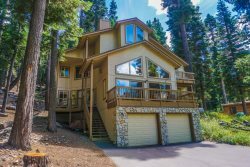 There is a hiking trail right next to this home that leads up to beautiful views of Fallen Leaf Lake and Lake Tahoe. Camp Richardson beach in South Lake Tahoe is popular during the Summer and is only a short bike ride or drive away. Saturday to Saturday bookings are preferred. Everything was great. It would have been nice to have a few basics in the fridge or cabinet (butter, olive oil, a few spices) but other than that, we had all the pans/towels we needed. It did get very hot inside the bedrooms (the thermostat didn't seem to be blowing cold air/AC). MANAGER's RESPONSE: Home does not have air conditioner as most homes in the mountains do not. Typically we do provide salt/pepper/oil in the cabinet, but nothing perishable such as butter. · Renters must park in garage or in driveway and that includes a boat trailer.